In the Tabby Shorthair classes, which were dominated by Silver and Brown Classic Tabbies, the Red Tabbies often had a hard time of it. And even when successful, they also had to compete for Best Shorthair, against the classic Blues and Solid Whites (often Blue-eyed), which were often seen as the 'glamour cats'. But one or two did stand out and during the period from 1895 through to 1905, 'Ch. Ballochmyle Perfection' was one such cat. 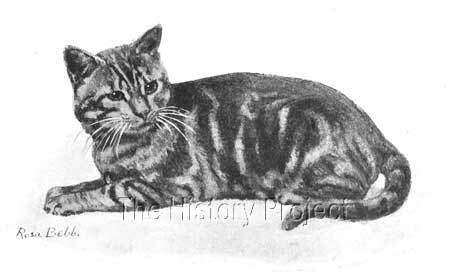 Like his great grandfather, the celebrated brown tabby 'Ch.Xenophon', he lived long, and had a successful show career within his own colour class, running up an impressive record of two Gold Medals, over 100 firsts, numerous championships,(as of 1903) and still winning First and Specials for Best of Colour at the Crystal Palace at 11 plus years of age! By her reference to the 'chip off the old block' we can only surmise that she may be referring to his paternal great grandsire, 'Ch. 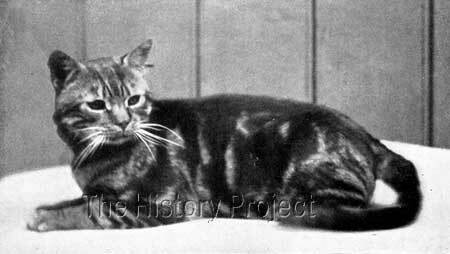 Fulmer Xenophon', quite possibly the most celebrated Classic Tabby Shorthair of all time. 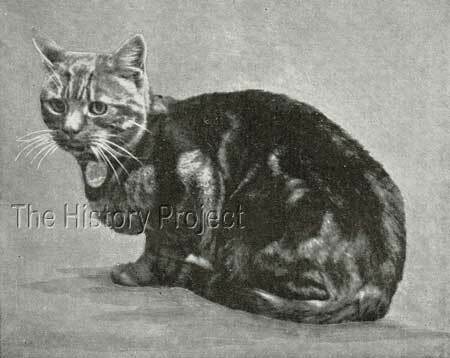 He appears then to have become the property of Mr George Towlerton, during which time he sired a female named "Goldfinder", bred by Mr R Kuhnel, (famous for his line of Red Tabbies), before he was finally on-sold to Lady Alexander. This transfer to Lady Alexander appears to have taken place in all probability around 1898, as from early 1899, she starts registering 'Ballochmyle' progeny sired by him. At this point in time, we have found no siblings of 'Ballochmyle Perfection'. Goldfinder appears to have gone to Mr T.Wilkinson, who bred her back to 'Perfection', and then she and her progeny both become the property of Lady Alexander. 'Golden Poppy' - Shorthair Red Tabby Female. Appears to have been retained by Mr Towerton. 'Perfection Junior' appears to have been retained as a stud for breeding by MrTowlerton, while 'Red Eagle' was neutered and transferred to Lady Alexander as 'Ballochmyle Red Eagle'. 'Ballochmyle Perfect Still' - Shorthair Red Tabby Female by 'Perfection' and out of 'Goldfinder'. The result of this Father/Daughter breeding returning to the stud owner, Lady Alexander. 'No Fool', listed in the first litter above, is later found as "Ballochmyle No Fool", and appears in time as the dam of the next generation, namely a Grandson of Perfection, named "Ballochmyle Red Prince", sired by Mr Kuhnel's 'Wharfedale Sam'. 'Red Prince'; is alluded to in Frances Simpson's references to the progeny and grand-progeny of 'Perfection' in The Book of The Cat (1903). Photo: 'The Tatler', 9th November, 1904. Taken at The Crystal Palace. This image is a cropped Press Photo, taken by Russell & Sons, of the Crystal Palace, and appearing in a news report on Show winners at the Crystal Palace, published in 'The Bystander' on November 1st , 1905. 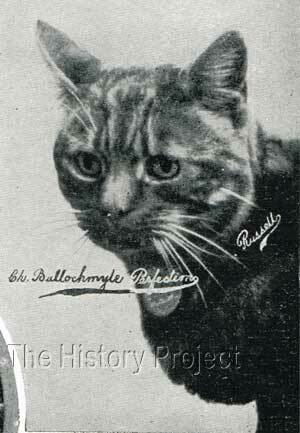 The caption reads: "Lady Alexander's 'Ballochmyle Perfection' which was successful in the Red Tabby class". When this photo was taken, 'Perfection' was already over 11 years old.5 Image courtesy of The Harrison Weir Collection.